Office Hours: Wed. 11am – 12:00pm, Thu. 10:00-11:00am and by apt. In 2011, following a decade of research across four continents, and after a year teaching linguistics at Carleton, I settled in the French Department as a professor of French linguistics. For me, French and linguistics are, like Montréal and smoked meat, inseparable: it was my love for French that motivated me to pursue three degrees in linguistics, and my love for linguistics has opened up my eyes to the astonishing diversity of the French language, both historically and as it is spoken around the world today. My interests revolve around Canadian French and African French, particularly in the areas of prosodic phonology and phonological variation. I am also fascinated by the effects of interaction between these varieties and the languages around them. My current projects focus on the mapping of Iran’s languages. Language maps that have been produced elsewhere for Iran are either limited in geographic scope, or they rely on general impressions of where languages are spoken, without reference to specific locations or language data. In light of this, I am using the Nunaliit Atlas Framework to couple geographic and demographic information with equivalent sets of actual language forms (pronunciation, grammar, and words) originating from all districts in the country. A working classification of all of Iran’s languages and dialects as well as language data questionnaires are available on the project website, and detailed language maps are currently being assembled for Hormozgan Province of south-west Iran. 2016–2018. 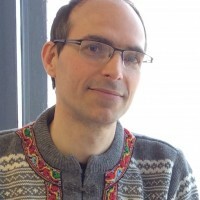 Social Sciences and Humanities Research Council Canada, Insight Development Grant: “A pilot atlas of the languages of Iran.” Co-investigator: Fraser Taylor. 2014. Visiting Scholar, Leiden University Center for Linguistics. 2010. Swedish Research Council: “Documentation of minority languages in Iran, sociolinguistic milieu and the role of language in individual and group identity.” Principal investigator: Carina Jahani. Erik Anonby, unit leader for documentation of Kumzari, dialect of Larak Island. 2014. Most of the world’s languages are disappearing. Does it matter? Carleton University Spring Conference, May 2-4, 2014. 2014. Qu’est-ce que découvrir une « nouvelle » langue ? Enjeux et identités dans la documentation linguistique. Causeries du département de français / Language, logic and information laboratory joint presentation, Carleton University, March 14, 2014. 2013. French in North Africa: Sociolinguistic situation and linguistic features. Guest lecture, Ethnography of North Africa, Carleton University, October 22, 2013. 2013. In language survival, is every barrier a barrier? How speakers of Majma-Ma use obstacles as a context for response. FEL XVII – 17th Conference of the Foundation for Endangered Languages: Endangered languages beyond boundaries: Community connections, collaborative approaches, and cross-disciplinary research, Carleton University, October 1-4, 2013. 2013. (with Hassan Mohebbi Bahmani). Discovery of an Indo-Aryan language in Iran. ICIL5 – 5th International Conference of Iranian Linguistics, Universität Bamberg, August 24-26, 2013. 2011. Iranian–Semitic contact in the Strait of Hormuz: The case of Kumzari. Guest lecture, Språk och litteraturer i Mellanöstern, Central- och Sydasien, Oriental Studies, Department of Linguistics and Philology, Uppsala University, October 7, 2011. 2011. The appearance of velaro-pharyngeal emphasis in Kumzari as an effect of Arabic contact. Invited presentation, Iranian Seminar series, Department of Linguistics and Philology, Uppsala University, September 28, 2011. 2011. (with Christina van der Wal). Iran’s human mosaic. Invited presentation, Iran Cultural Day, Iranian Cultural Society, National Arts Centre, Ottawa, June 9, 2011. 2011. Le français de l’Afrique : agent ou patient ? Le langage chez les Mambay du Cameroun. Invited presentation, French Department, Carleton University, April 7, 2011. 2010. Inheritance and adoption: How unrelated structures co-exist in Kumzari. Invited presentation, Leiden Institute of Area Studies, Middle East lecture series, April 8, 2010. 2010. Divided we stand: Effects of transnationality on minority language vitality. Invited presentation, Department of Frisian Language and Culture, University of Groningen, April 7, 2010. 2010. (with Christina van der Wal). Arma u mi’i: Essentials of Kumzari poetry. Invited presentation, Persian Poëzieavond, Department of Middle Eastern Languages and Cultures, Leiden University, January 15, 2010. 2008. Kumzari: Language between two worlds. Invited presentation, Department of Linguistics and Philology, Uppsala University, October 21, 2008. 2008. Stress-induced vowel lengthening and harmonization in Kumzari. Paper presented at the 1st International conference on languages and dialects in Iran, University of Sistan and Baluchestan, October 28-31, 2008. 2008. Morphological templates and ideophonic derivation in Mambay (Niger-Congo, Adamawa). Paper presented at the 38th Colloquium of African languages and linguistics, Leiden University, August 25-27, 2008. 2004. The labial flap in Mambay (Niger-Congo, Adamawa). Paper presented at the 34th Colloquium of African languages and linguistics, Leiden University, August 23-25, 2004.